Nick Dutton, owner of Hands Too Bait and Tackle in Cape May, N.J., recently reported fighting bluefish from the town’s surf. A new Ocean Born popper caught best, he said. The lure was the easiest popper he ever fished, he said, apparently meaning that the lure popped and splashed water better than other poppers. The lure floated high, he said. That’s one branch of a parent company named A Band of Anglers that famous lure-maker and angler Patrick Sebile founded. If you’re an angler, you likely know his previous company, Sebile Lures, that he sold to another company. 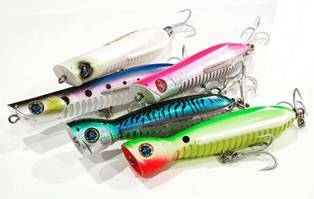 Ocean Born currently sells two lures, both poppers for saltwater fishing, especially for striped bass, but also many other catches. They’re named Flying Poppers, and one is a popper, and the other is a pencil popper. The Flying Popper is a classic design with a narrow neck traditionally known for castability and fishing in all conditions, including rough water and current. This popper is meant to dramatically increase casting distance without sacrificing action or the ability to hook fish. Something different is that the popper features “wings” on the sides to enhance aerodynamics but also to “give the lure lift” once in the water. The lure also features unique ribs to reduce air resistance and add water turbulence. We don’t know how the ribs reduce air resistance, but we’ll take Ocean Born’s word for that. Ribs would naturally seem to add water turbulence. Each of the company’s poppers, both the popper itself and the pencil, is available in floating, sinking or super long distance models. The sinking and super long distance versions of the Flying Popper, the narrow-necked plug, offer great action on a slow retrieve, like a lipped lure. The Flying Pencill, in the photo at left – the name is spelled with two L’s – has a common body shape but uncommon castability and action, the company says. It also features the wings and ribs, and this all makes this pencil cast farther and move more enticingly than any other pencil, Ocean Born says. The pencil is extremely versatile and easy to master, it says. Depending on whether you fish the floating, sinking or super long distance, you can pop, spit, skip, walk the dog or slowly swim under the water surface the popper and the pencil. The popper and pencil are available in many different colors. Ocean Born currently is the only branch of the parent company A Band of Anglers. A Band of Anglers plans to introduce more branches, like one for soft-plastic baits, but not just any soft-plastics. The soft-plastics are planned to be super-durable, even withstanding the ferocious teeth of a bluefish. Ocean Born is meant to specialize in hard baits for big fish in saltwater. The idea behind A Band of Anglers is that Sebile wants to put together a team instead of doing most of the innovation himself. He reportedly said that if he could re-do anything from Sebile Lures, he’d make it more of a team effort. He sold Sebile Lures to Pure Fishing, a parent company of many famous tackle manufacturers, in 2011, and stayed on as a consultant until 2017. When Nick from Hands spoke about how he liked Ocean Borns, I don't think he was just trying to sell the lures. He's a surf angler, and just seemed excited about the plugs. 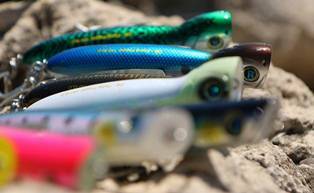 For more info about Ocean Born’s Flying Popper Lures, visit A Band of Brothers’ website.